Ana Mardoll's Ramblings: Author Interview: Jeffrey Getzin on "Prince of Bryanae"
Author Interview: Jeffrey Getzin on "Prince of Bryanae"
Ana: Today we have Jeffrey Getzin introducing his novel "Prince of Bryanae". I haven't read this book myself, but Jeff was kind enough to agree to guest blog about his book to any readers who might be interested in the subject. Jeff, how would you describe your novel to your prospective readers? In broad terms, what is your novel about? 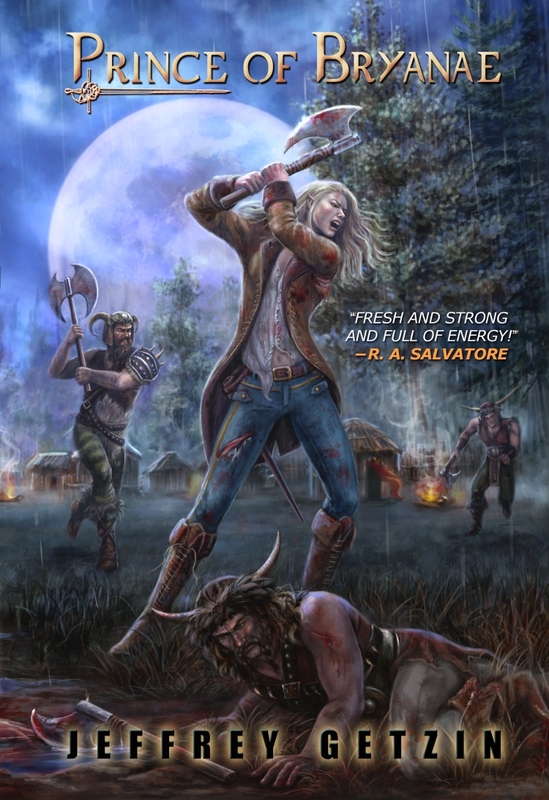 Jeff: In broad terms, "Prince of Bryanae" is a dark fantasy novel about Willow, an elven soldier who's obsessed with self-discipline and the fighting arts as way of suppressing the traumatic memories of her brutal past. When enemies from her past kidnap the titular Prince while she watches frozen in fear, she must confront that past to rescue him. "Prince of Bryanae" is very much a character-driven novel, but features exciting battles, intrigue and plot twists, and even some humor and romance. Jeff: A major theme in my works is that of redemption: the idea that through some cathartic undertaking, one can rise above one's unfortunate circumstances. The journey that Willow takes is an exciting adventure, of course, with lots of action and humor and plot twists, but at its core it's all about the journey she takes from being a shattered shell of a woman to become a more complete and whole person than she is when the book begins. Another theme "Prince of Bryanae" explores is how early events can shape who we become as people. How much of who we are is because of what we experience in our lives? Is change possible? Is it even desirable? I recently learned that "Prince of Bryanae" has special significance now, while we are at war in Iraq and Afghanistan. While I don't come right out and say it in the book, Willow is essentially suffering from Post Traumatic Stress Disorder. To be honest, I didn't realize how topical my book was when I was writing it, but subsequent praise by soldiers with PTSD and spouses of soldiers with PTSD has been very fulfilling to me as an author. Willow's travails resonated with those readers, and more than anything, I want my readers to feel when they read POB. Mind you, I did my best not to be heavy-handed with any of these themes. POB is first and foremost a thrilling adventure, and I want people who read my book to get drawn into the story and the characters. All these themes then are intended to enrich the adventure and make it more meaningful, not to supplant it. Jeff: While "Prince of Bryanae" is my first published novel, it's the second one that I wrote. I remember reading some advice from a genre author (I believe it was Orson Scott Card) who suggested that an author's second book shouldn't be a sequel to his first, or at least not a direct sequel. That brought together a number of ideas. Willow figures into my first novel as a minor villain, but she was such an intriguing character! I'd frequently lay in bed at night wondering about what made her who she was. Around the same time, I ran a very successful Dungeons and Dragons game with a swashbuckling theme that involved the kidnapping of the Prince of Bryanae and subsequent attempts to rescue him. What made this book so much fun to write was the challenge of making a seemingly cold and brutal woman into a protagonist in whom the reader could invest their emotions. Somehow, I had to make her sympathetic. I found two things that I felt could accomplish this. First, it seemed to me that you could sympathize with almost anybody if that person has a bad enough day. So I gave her one hell of a bad day, the kind of day that makes getting fired or divorced seem relaxing and fun by comparison. Second, if someone intelligent and kind loves this character, well, that's enough to make us take a second look, isn't it? So I introduced the readers to Tamlevar. He's bright, and he's charming, he's kind, and he's courageous … and he loves Willow. Now perhaps that love is misplaced, but it still makes you think, doesn't it? There must be something he sees in Willow that makes him love her, and it's also that love that ultimately helps Willow become a better person. Once I had all these ideas bouncing around in my brain, I had to write this book. I felt that I had a great story to tell: one that would resonate with readers and make them laugh and maybe even cry in places. Additionally, my protagonist Willow has been favorably compared to Elizabeth Moon's "Paksenarrion". Like both author's works, "Prince of Bryanae" tends to be on the darker side of fantasy. Jeff: As I mentioned earlier, "Prince of the Bryanae" is my second novel. I never published the first book one because, frankly, my skills as a writer hadn't sufficiently developed when I wrote it and while it was enjoyable, it wasn't a particular strong book. I'm currently in the process of revising that novel to make it something worth reading, but that hadn't always been my plan. However, I am preparing that first book "King of Bryanae" for publication. Since it's a comparatively short novel, I'll also be including my novella "Shara and the Haunted Village", which again features some crossover in the world and cast, and again, stands on its own as a complete work. I'm also tossing around the idea for a third and final novel in the Bryanae series, but it hasn't fully gelled yet, the way it did with POB. When or even if this book will see the light of day depends entirely on what my subconscious can come up with. If the story solidifies tonight, I may start writing the novel immediately; or it might take years before I write it. Whatever I do, I don't want that third book to be a disappointment to those who have loved "Prince of Bryanae". I'd prefer to write nothing at all than to disappoint my readers. In addition, readers can learn more about me and my books on my website, where they can also contact me for questions and/or to leave feedback. Or send me money. I'm big on the idea of people sending me money! (Hey, a fellow can dream, can't he?) "Prince of Bryanae" also has its own Facebook page. Ana: Thank you, Jeff. I understand you have the first chapter of your novel available as an excerpt for interested readers? And is there anything else you wish to add for our readers? Jeff: Indeed, I have the first four chapters available for reading on my web site. In addition, users can read longer excerpts on Amazon.com and Google Books. Thank you, Ana, for this wonderful interview. I hope that it helps pair my book with readers who are likely to enjoy it.